These three proven technologies actively reduce airborne contaminants. 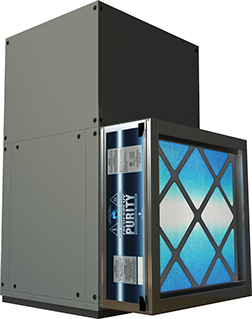 By attaching Air Purity air purifier to the central air system (furnace/air handler) it purifies the air throughout your home. Airborne contaminants include: particulates, biologicals, and odors/VOCs. Some high efficiency filters will capture some particulates. Only Purity addresses all three. UV REACTIVE filter – This efficient MERV 11 filter media kills germs with Goldshield™ antimicrobial nanotechnology and works with the UV light to trap and destroy microbes. Special filter material will not degrade from exposure to UV light. Germicidal UVC light – The UVC light inside Purity sterilizes biological contaminants such as mold, bacteria, viruses, allergens, etc. in the air as they pass through the system. UV light also reduces microbial growth on air system interior surfaces. Photocatalytic media – UVC light shining on this specially prepared filter media creates a photocatalytic effect which captures volatile organic compounds (odor molecules) and transforms them into harmless water vapor and carbon dioxide. Don’t let your friends smell the cat box or last night’s cooking! You could use a spray or a candle but that just perfumes the air. Purity actually removes odors because it TRANSFORMS ODORS and VOC molecules into harmless water vapor and CO2. So keep the cat, and fry that fish! Your air purifier system will take the smell away for you! All can be spread throughout the home by the central air system as it cycles the air. Purity uses this cycling to sterilize microbes as they pass through the system. Purity’s four inch UV Reactive Filter Media does a great job of removing dust and particles from the air, including things like pet dander. These filters not only have a high efficiency rating (MERV 11) they are specially designed to be resistant to UVC light exposure which most filters are not. In addition Purity RFM filters are coated with GoldShield, an antimicrobial surface treatment used by hospitals on blankets and curtains to reduce infection. Purity detoxes the air with a process called photocatalytic oxidation (PCO), a technology similar to the catalytic converter on your car’s exhaust. UVC light reacts with titanium dioxide infused into the carbon which effectively disintegrates the captured contaminants, leaving only harmless water vapor and CO₂ which are released back into the air. The result is clean, odor-free air throughout the home thanks to your air purifier system.